"This book is a gold mine of fundamental and practical information in an area not previously well represented in book form." "... destined to become a classic reference work for workers at all levels in structural bioinformatics...recommended with great enthusiasm for educators, researchers, and graduate students." "...a useful and timely summary of a rapidly expanding field." "...a terrific job in this timely creation of a compilation of articles that appropriately addresses this issue." Jenny Gu, PhD, is Assistant Professor at the Skaggs School of Pharmacy and Pharmaceutical Sciences University of California, San Diego. This is her first book. Philip E. Bourne, PhD, is professor in the Department of Pharmacology at the University of California, San Diego, and Director of Integrated Biosciences at the San Diego Supercomputer Center. He is past president of the International Society for Computational Biology (ISCB). He is author of over 125 peer-reviewed scientific papers and four previous books. Section I DATA COLLECTION, ANALYSIS, AND VISUALIZATION. 1 DEFINING BIOINFORMATICS AND STRUCTURAL BIOINFORMATICS (Russ B. Altman and Jonathan M. Dugan). 2 FUNDAMENTALS OF PROTEIN STRUCTURE (Eric D. Scheeff and J. Lynn Fink). 3 FUNDAMENTALS OF DNA AND RNA STRUCTURE (Stephen Neidle, Bohdan Schneider, and Helen M. Berman). 4 COMPUTATIONAL ASPECTS OF HIGH-THROUGHPUT CRYSTALLOGRAPHIC MACROMOLECULAR STRUCTURE DETERMINATION (Paul D. Adams, Ralf W. Grosse-Kunstleve, and Axel T. Brunger). 5 MACROMOLECULAR STRUCTURE DETERMINATION BY NMR SPECTROSCOPY (John L. Markley, Arash Bahrami, Hamid R. Eghbalnia, Francis C. Peterson, Robert C. Tyler, Eldon L. Ulrich, William M. Westler, and Brian F. Volkman). 6 ELECTRON MICROSCOPY IN THE CONTEXT OF STRUCTURAL SYSTEMS BIOLOGY (Niels Volkmann and Dorit Hanein). 7 STUDY OF PROTEIN THREE-DIMENSIONAL STRUCTURE AND DYNAMICS USING PEPTIDE AMIDE HYDROGEN/ DEUTERIUM EXCHANGE MASS SPECTROMETRY (DXMS) AND CHEMICAL CROSS-LINKING WITH MASS SPECTROMETRY TO CONSTRAIN MOLECULAR MODELING (Sheng Li, Dmitri Mouradov, Gordon King, Tong Liu, Ian Ross, Bostjan Kobe, Virgil L. Woods Jr, and Thomas Huber). 8 SEARCH AND SAMPLING IN STRUCTURAL BIOINFORMATICS (Ilan Samish). 9 MOLECULAR VISUALIZATION (Steven Bottomley and Erik Helmerhorst). Section II DATA REPRESENTATION AND DATABASES. 10 THE PDB FORMAT, mmCIF FORMATS, AND OTHER DATA FORMATS (John D. Westbrook and Paula M.D. Fitzgerald). 11 THE WORLDWIDE PROTEIN DATA BANK (Helen M. Berman, Kim Henrick, Haruki Nakamura, and John L. Markley). 12 THE NUCLEIC ACID DATABASE (Bohdan Schneider, Joanna de la Cruz, Zukang Feng, Li Chen, Shuchismita Dutta, Irina Persikova, John D. Westbrook, Huanwang Yang, Jasmine Young, Christine Zardecki, and Helen M. Berman). 13 OTHER STRUCTURE-BASED DATABASES (J. Lynn Fink, Helge Weissig, and Philip E. Bourne). Section III DATA INTEGRITY AND COMPARATIVE FEATURES. 14 STRUCTURAL QUALITY ASSURANCE (Roman A. Laskowski). 15 THE IMPACT OF LOCAL ACCURACY IN PROTEIN AND RNA STRUCTURES: VALIDATION AS AN ACTIVE TOOL (Jane S. Richardson and David C. Richardson). 16 STRUCTURE COMPARISON AND ALIGNMENT (Marc A. Marti-Renom, Emidio Capriotti, Ilya N. Shindyalov, and Philip E. Bourne). 17 PROTEIN STRUCTURE EVOLUTION AND THE SCOP DATABASE (Raghu P. R. Metpally and Boojala V. B. Reddy). 18 THE CATH DOMAIN STRUCTURE DATABASE (Frances M. G. Pearl, Alison Cuff, and Christine A. Orengo). Section IV STRUCTURAL AND FUNCTIONAL ASSIGNMENT. 19 SECONDARY STRUCTURE ASSIGNMENT (Claus A. Andersen and Burkhard Rost). 20 IDENTIFYING STRUCTURAL DOMAINS IN PROTEINS (Stella Veretnik, Jenny Gu, and Shoshana Wodak). 21 INFERRING PROTEIN FUNCTION FROM STRUCTURE (James D. Watson, Gail J. Bartlett, and Janet M. Thornton). 22 STRUCTURAL ANNOTATION OF GENOMES (Adam J. Reid, Corin Yeats, Jonathan Lees, and Christine A. Orengo). 23 EVOLUTION STUDIED USING PROTEIN STRUCTURE (Song Yang, Ruben Valas, and Philip E. Bourne). 24 ELECTROSTATIC INTERACTIONS (Nathan A. Baker and J. Andrew McCammon). 25 PREDICTION OF PROTEIN–NUCLEIC ACID INTERACTIONS (Timothy Robertson and Gabriele Varani). 26 PREDICTION OF PROTEIN–PROTEIN INTERACTIONS FROM EVOLUTIONARY INFORMATION (Alfonso Valencia and Florencio Pazos). 27 DOCKING METHODS, LIGAND DESIGN, AND VALIDATING DATA SETS IN THE STRUCTURAL GENOMICS ERA (Natasja Brooijmans). 28 CASP AND OTHER COMMUNITY-WIDE ASSESSMENTS TO ADVANCE THE FIELD OF STRUCTURE PREDICTION (Jenny Gu and Philip E. Bourne). 29 PREDICTION OF PROTEIN STRUCTURE IN 1D: SECONDARY STRUCTURE, MEMBRANE REGIONS, AND SOLVENT ACCESSIBILITY (Burkhard Rost). 30 HOMOLOGY MODELING (Hanka Venselaar, Elmar Krieger, and Gert Vriend). 31 FOLD RECOGNITION METHODS (Adam Godzik). 32 DE NOVO PROTEIN STRUCTURE PREDICTION: METHODS AND APPLICATION (Kevin Drew, Dylan Chivian, and Richard Bonneau). 33 RNA STRUCTURAL BIOINFORMATICS (Magdalena A. Jonikas, Alain Laederach, and Russ B. Altman). 34 STRUCTURAL BIOINFORMATICS IN DRUG DISCOVERY (William R. Pitt, Alı´cia Perez Higueruelo, and Colin R. Groom). 35 B-CELL EPITOPE PREDICTION (Julia V. Ponomarenko and Marc H.V. van Regenmortel). 36 METHODS TO CLASSIFY AND PREDICT THE STRUCTURE OF MEMBRANE PROTEINS (Marialuisa Pellegrini-Calace and Janet M. Thornton). 37 PROTEIN MOTION: SIMULATION (Ilan Samish, Jenny Gu, and Michael L. Klein). 38 THE SIGNIFICANCE AND IMPACTS OF PROTEIN DISORDER AND CONFORMATIONAL VARIANTS (Jenny Gu and Vincent J. Hilser). 39 PROTEIN DESIGNABILITY AND ENGINEERING (Nikolay V. Dokholyan). 40 STRUCTURAL GENOMICS OF PROTEIN SUPERFAMILIES (Stephen K. Burley, Steven C. Almo, Jeffrey B. Bonanno, Mark R. Chance, Spencer Emtage, Andras Fiser, Andrej Sali, J. Michael Sauder, and Subramanyam Swaminathan). Bookcast Click here to listen to the editor Philip E. Bourne and watch a bookcast. Dedicated Website Click here to download PowerPoint slides featuring 125 full colour figures from the book. A compilation of chapters contributed from leading experts in the field. There are no other books that directly and so comprehensively address the field in this way. Updates include new frontiers for the field of Structural Bioinformatics, such as understanding membrane proteins, protein motion, dynamics, and evolution, not well covered by other texts. Useful for both those new to the field as well as seasoned professionals. Comprehensive reference list on each topic for those who wish to dig deeper. Where structural bioinformatics has had significant impact on other fields such as immunology and drug discovery are highlighted. A logical organisation which takes the reader from the fundamentals of protein, DNA and RNA structure, through the methods of data collection to inherent errors in the data. This is followed by how the data are classified, stored and subsequently used in a myriad of scientific studies. 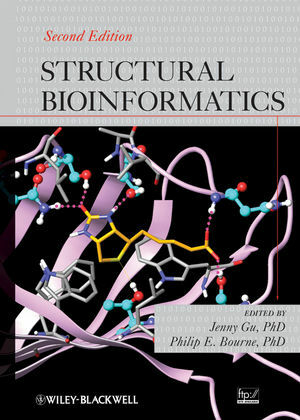 Expanded section on the application of structural bioinformatics to facilitate drug discovery and new therapeutics. Expanded section on nucleic acid structures, in particular protein-DNA interactions and RNA structures, which recent findings significantly highlights the complexity of biological processes. Unique discussion on leveraging protein structures to understand properties encoded in protein sequence for structure prediction, protein design, and understanding molecular dynamics. A unique view into the future of the field defined by today's experts.